If a person in advertising had to define their title, ‘storyteller’ would rise to the upper echelon of the list. No matter what background, every single business has a history. It came from somewhere based on an ideal or two that drove the owner(s) to break through the wall and succeed. You can spin a story however you like, but often times, they are inspiring due to a small business’s circumstances at the start. 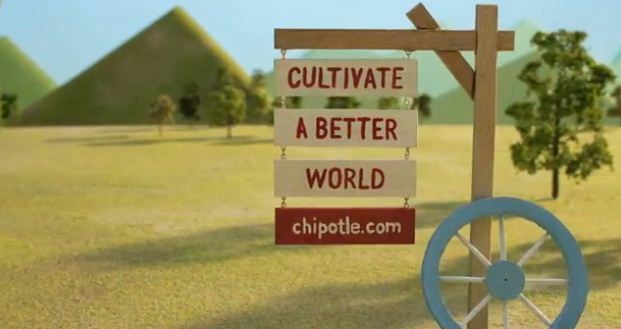 CAA agency’s lengthy Chipotle advertisement won the 2012 Branded Content Lions Grand Prix award for telling Chipotle’s simple, inspirational story in a well-fitting stop-motion technique. 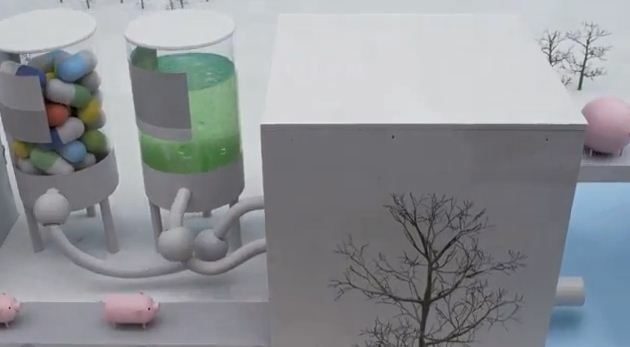 The ad opens with a claymation farmer’s family and their grazing pig standing on a farm. The pig seems part of the family, like a dog. This relationship slowly changes as we cheer for the farmer to build up his farm as become a success. Commercialization turns Mr. Farmer’s land into more of a factory manufacturing ‘produce’ food. Then late at night, the farmer comes to the realization that something isn’t quite right about how he reaches the end product. The pig no longer feels like the family pet. The farmer then tears down the assembly line and returns to the way he started: treating animals as more than just a consumable product. The farmer’s coming of conscience message is probably what won the award. Organic and fresh food promotions are nothing new, but the ad focuses on the animal’s benefit, not the person’s health benefit from consuming organic food. We hoped for the farmer to succeed at the beginning of the commercial and made a true connection. This connection then forces the viewer to also question if our current food production methods are okay. It’s easy to say something is bad, and even to show how something is bad, but Chipotle goes above and beyond and makes the viewer come to Chipotle’s conclusion on the viewer’s own will. Let’s not forget about the execution, which has a lot to do with connecting to the farmer and showing animal mistreatment without being over the top. In one episode of Mad Men, Peggy presents a new animation technology showing dancing beans to make the client’s product look more exciting and fun. The client didn’t really go for it, but they liked the approach because bean close-ups look reminiscent of intestines. Pretty gruesome, right? Similarly, the Chipotle ad avoids potentially gruesome factory scenes that you can get watching Food Inc. Instead of wanting to vomit, the audience feels warm in fuzzy inside watching little piggies and pleasantly plump farmers wonder about. The cartoon approach also lets CAA exaggerate til believable, like in the Nike FuelBand ad. The blimp-shaped pigs on the production line look just disproportionate enough to make you feel uncomfortable without making you feel jaded towards the message Chipotle wishes to convey. Last, because the farmer isn’t a real person with a defined face, more people can connect with him. Add in some country-vibe Willie Nelson singing a touchingly relevant Coldyplay song, and Chipotle has your heart right where they want it. I could do without the absurdly round people, but maybe that’s Chipotle’s shot at making you feel okay about eating a massive burrito. The pigs are just disproportionate enough to make you feel uncomfortable while not seeming too exaggerated to lose the viewer’s respect for their message. Perhaps the best part about this advertisement from a sales point of view is it will sell burritos too. Chipotle competes with consumers in the upper tier of fast food: Jimmy Johns, Qdoba, Moe’s, Yatz, etc. – places that cost a little more to sit and eat but keep your watch happy while doing so. These potential consumers have the wallets to choose to be environmentally conscious, which is why this ad’s message is a great unique selling point to associate with Chipotle. People in this target market probably use iTunes frequently, and by adding the iTunes snippet at the end, Chipotle seems up to date on technology and makes going off and buying the song on iTunes feel okay. Plus, the song can go in conversations and places that a commercial/Youtube video can’t and will remind the listener of Chipotle and their message… Perhaps at a quarter til noon? The Chipotle ad couldn’t have been executed any better. The animation approach opens the door to connect with the farmer and the pigs while avoiding unappealing images, and the music puts people in the right frame of mind while taking the client’s presence much further than the television. Chipotle’s message makes you feel great about what they’re doing and may earn enough respect to make a purchase. But to win an award, they ask you to ‘Cultivate a Better World,’ which you’ve already accepted to do with the farmer halfway through the ad. That free-will decision wins my award. to win in an award, they ask you to ‘Cultivate a Better World,’ which you’ve already accepted to do with the farmer halfway through the ad. ← Cannes 2012 Analysis #1: Nike FuelBand a Marketing Strategy or a Product?